Myanmar is a UN member stateand its foreign policy is to maintainfriendly relations with all countries.Myanmar always stands on thecorrect point in the prevailing internationalsituation and is cooperating with the UN. The UN’s stand needsthe trust of small countries including Myanmar. 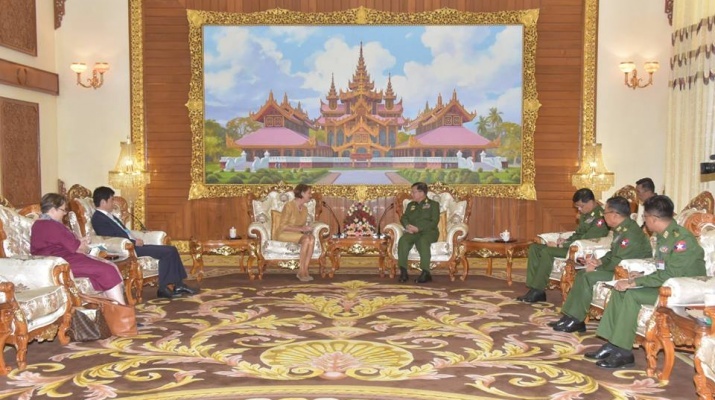 All assistance should be constructive, said Commander-in- Chief of Defence Services Senior General Min Aung Hlaing at his meeting with Special Envoy on Myanmar of the UN Secretary General Ms. Christine Schraner Burgener at the parlour of Bayintnaung Villa here this morning. 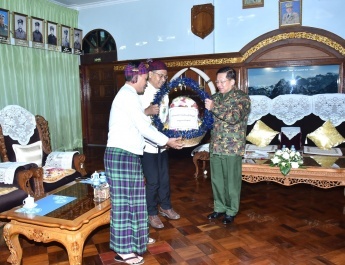 Also present at the meeting together with the Senior General were Chief of the General Staff (Army, Navy and Air) General Mya Tun Oo and senior military officers of the Office of the Commander- in-Chief (Army). 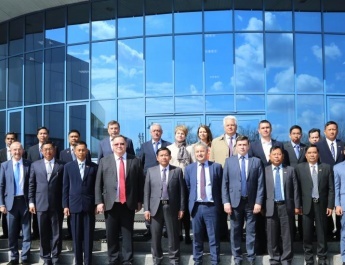 Ms. Christine Schraner Burgener was accompanied by Team Leader of South and Southeast Asia of the Asia-Pacific Division Mr. Shin Umezu and offi cials. The Special Envoy said her visit is to know the true situation of Myanmar and to submit it to the UN and asked the opinion and attitude of the Senior General. 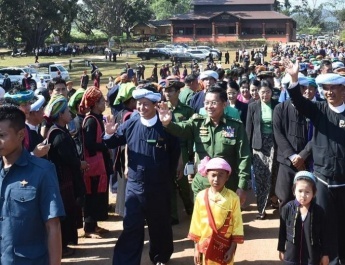 The Senior General said the Tatmadaw has the responsibility to fully protect the State and the lives and property of the ethnic people. The Tatmadaw is a part of the nation, and it was founded at the time when the country regained independence. The Tatmadaw members are serving their duties under the discipline, laws, orders and directives. The Tatmadaw had played an important role throughout the successive periods of Myanmar history. It has led the country towards the democracy path. In the issue of Rakhine State, the Tatmadaw was just serving its duty of restoring regional peace and stability and protecting the lives and property of the ethnic people. It has never done any acts that may harm the other country, other organizations and the human society. 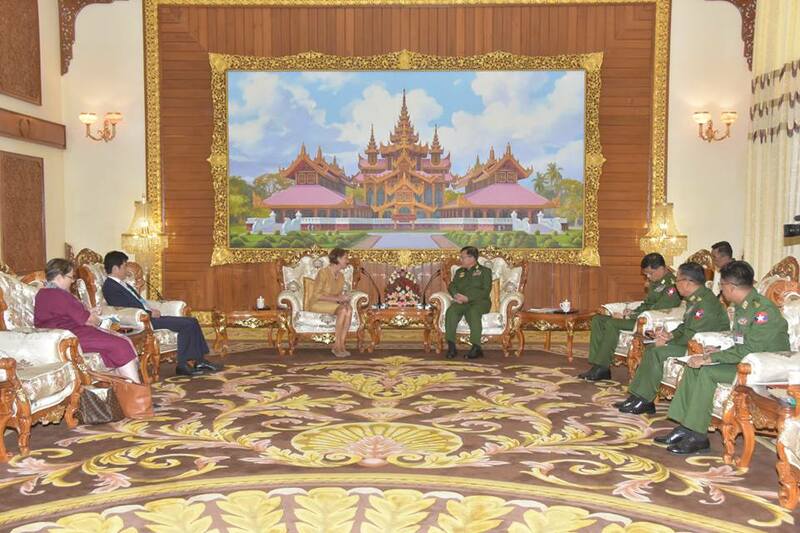 As a member of the United Nations, Myanmar is actively cooperating under the UN leadership. The Tatmadaw’s aims and objectives are to work together with the government to achieve eternal peace by signing the Nationwide Ceasefire Agreement-NCA with all ethnic armed organizations, to enable all the people to enjoy full rights of democracy by fi rmly pursuing multi-party democracy, to cooperate with the international community, to have good relations with the neighbouring countries and to ensure peace and stability. 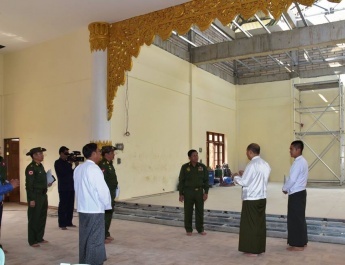 There stages are still ongoing, and there has been some misunderstanding of the Tatmadaw over its involvement in these efforts before reaching the goals. The UN cooperation will lead to progress in Myanmar’s situations. There is diffi culty with local ethnic people accepting the UN-led organizations carrying out their activities in Rakhine State. However, one thing needs to be considered is that the activities of UN agencies are welcomed in other regions. When conflicts arise, it is necessary to distinguish between the act of individuals and that of the Tatmadaw. Myanmar is still weak in democracy experience, wisdom and other sectors such as education and health. In its effort to build up a Standard Army, the Tatmadaw is trying to work in cooperation with the international community. However, bias and restrictions of the UN as well as some countries cannot be assumed as constructive attitude, the Senior General commented He continued to say that the expressions of a leader containing unfounded information and false news are sheer negative actions and that will lead to hatred, misunderstanding and unwillingness to cooperate. There are two Myanmar sayings that go by “Let the amicable relations last long and let the hatred shorten” and “Try to make a big case small and a small case disappear.” However, going against these sayings, acts of trying to prolong hatred and make the small case larger can be found. In a meeting with representatives of the permanent UN Security Council member countries, some countries showed constructive attitude while some acted with misunderstanding. It is therefore necessary for the UN to bring effective, constructive relations, the Senior General urged. With regard to Bengalis, the Senior General explained those who came to live in Rakhine State were accepted as Bengalis. The usage Rohingya was a word they fabricated. Myanmar citizens do not at all accept the usage Rohingya. So, he called for avoiding the usage which may cause problem for Myanmar citizens. Bengalis mean those who come from Bengal. As they were brought from Bengal region in the colonial era, they are called Bengalis. According to the documents on 1872 census of Myanmar, they were named as Shiite, Pahtan and Muslim, not Rohingya. With regard to accepting Bengalis, the deserved ones of them will be accepted. They will be scrutinized to accept under the 1982 Citizenship Law. The international community needs to help Myanmar for solving the problem instead of imposing pressure. Then, they cordially discussed the matters related to removing Myanmar from the country list of using child soldiers, holding the roundtable discussion on Rakhine issue with the Fact-Finding Mission, and enhancement of cooperation with the United Nations in the future. The UN Secretary General’s Special Envoy on Myanmar pledged she will convey the full clarification to the United Nations. After the meeting, the Senior General and the UN Secretary General’s Special Envoy on Myanmar exchanged commemorative gifts and posed for a documentary photo together with those present.